By now, you’re probably familiar with the Settings app on your iPhone. It’s where you turn the features for the other iPhone apps on or off. The settings for Messages let you personalize the way iPhone alerts you that you have messages and offers some options for composing messages. To open Settings for messages, tap Settings→Messages. You’ll have to scroll down because Messages is a little way down the list after iCloud. iMessage: Tap this toggle switch on to activate the iMessage service, which lets you exchange messages with other iOS devices, such as iPhone, iPad, and iPod touch, as well as Macs running OS X 10.8 Mountain Lion, or OS X 10.9, Mavericks, over Wi-Fi or the cellular data network without cutting into your SMS allotment. 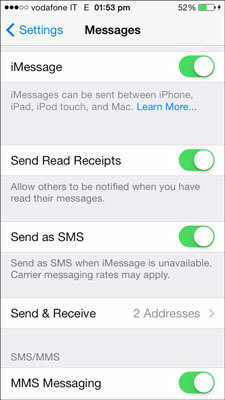 Send Read Receipts: When turned on, people who send you messages will be notified when you read their sent message. Send As SMS: If iMessage is unavailable, your message is sent as an SMS text message. Your cellular service plan may charge an extra fee for SMS. Send & Receive: Add additional e-mail addresses where you want to receive iMessages (in addition to your mobile phone number). Tap Send & Receive. The iMessage screen opens. Tap Add Another Email. The keyboard appears where you can type in the e-mail address you wish to add. Tap Messages at the top when you finish. MMS Messaging: With this feature on, you can send and receive photos, video, and voice memos and insert a subject line in the text field. You may have to enter information from your cellular service provider in the MMS section of Settings→General→Cellular→Cellular Data Network, and there may be an additional charge to send MMS. Group Messaging: If you turn this on, you can send one SMS/MMS message to several people, although responses come back only to you. This option isn’t available in all areas. Show Subject Field: With this switch on, a subject line appears before any text messages that you write — just like e-mail. This turns an SMS (Short Message Service) into an MMS (Multimedia Message Service). If you’re sending to someone who doesn’t have MMS capabilities, they may not receive your message. If you leave the subject field blank, it remains an SMS, or you can just keep this setting off. Character Count: Turn this switch on in conjunction with Show Subject Field and a character counter appears to the right of the text-entry field in the New Message screen so you can keep an eye on the length of your message. Blocked: This function lets you insert phone numbers you don’t want to receive calls, messages, or FaceTime from. If you set up blocked numbers from the Phone settings, they appear here as well. Change switches from on to off, or vice versa, with a simple tap. No swiping needed.